One of The Most Biggest Step's in The Human History !! Invitation for The Corporatocracy Cooperation and development of New Civilization's in The Universe. Every Bank in the world gain a legitimate right to use the name of the federal government for establishing a branch corporations factories for manufacturing a commercial levitating vehicle, Commercial Industrial zone in the territory Bir Tawil or anywhere in the world and then in the interest of economy of Diamond's Imperium. Each bank or government which would support government activities and, therefore, the Bank gains Complimentary levitating cars for every person who is in contact with the business operations and cooperation of logistics and organized with the Imperium of Diamond's. Decisions on stabilizing the interest of the government of the Imperium of Diamond's and achieving the ability to jointly develop a strategy of global welfare states and in collaboration with all the banks around the world in order to develop a network of business relationships between corporations and trading companies, and traders' associations, and so the building trade level global markets to support the joint development among partner states, banks and traders. Listing Finance Cheque 1 000 000 000 000 € for cooperation in the interest of each individual state. If the success of our common business profitable and economically advanced countries for the countries that will be in the next year budget is increased to a level 10 000 000 000 000 € for the creation of the annual turnover of the bilateral market. ID's stand is based on a form of stabilization levels, and therefore needs to get friendly help to ensure the function of systematic chain of financial authorities. Therefore, there is an act Global Bank Cooperation, the Bank's own right to create an office to conduct a joint investment fund deposits and beneficial business partnership with the Federal Government of Diamond's Imperium. The fund is used for financing joint investments and business partnerships, usage possibilities for the development of investment projects on the territory of Diamond's Imperium, and especially in order to develop cooperation on a range Corporatocracy ID's government and the World Diamond International Alliance. Every bank that will support the management of financial authority obtains the right to establish their own branch in the Imperium of Diamond's and thus activate their own investment and commercial or financial projects. 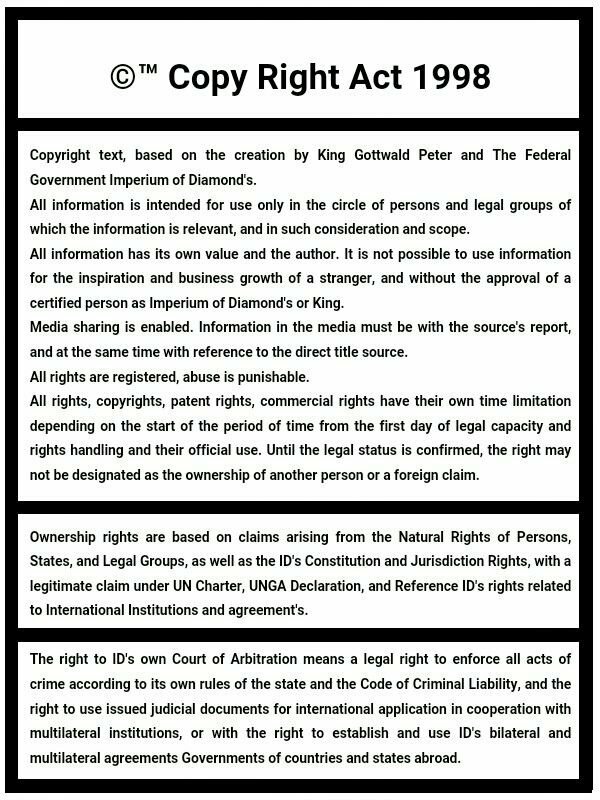 Each Bank to establish any authority and the association representing the territory of the Imperium of Diamond's therefore always own the right to use the access to conferences like ID's constitutional form International Bank Council of Imperium of Diamonds and contribute to the development of International markets and joint networks of market chain. Commercial form Bank in the ID's government territory may be the basis for a legal entity as the Representative seat, Contact officials or Commercial form of Financial Institution. Form of legal association can also be established by special agreements with the Government of Diamond's Imperium and therefore establishment of special form of Legal entity. Banks can thus be active on the territory of the Imperium of Diamonds and thus promote the development of civilization and in the strategy for the development of markets between our countries, and encourage the development of new business corporations of the State headquarters of the Bank. Banks can thus be members of ID's Corporatocracy and set up their own representational activities on the territory of the state Corporatocracy together with all traders of the Corporatocracy, and promote the development of new business corporations of the State headquarters of the Bank. Banks can thus be members of the International Alliance of WD and set up their own representational activities in the World Diamond State, together with all the World Diamond traders, and support the development of new business corporations of the State headquarters of the Bank. This creates a strategy for the Global Community Bank all around the world, in order to develop the global economy and the growth of our civilization and common markets. Banks, therefore, its own obligation to build on our joint financial cycles and agreements on financial movements, currency appreciation among states and encourage our legal relations of peace, friendship and stabilizing character. Banks thus have the right to support the organization among traders around the world and thus ensure the development of new investment projects. Banks jointly own the rights to negotiate International trade conference to develop a common business relations with the world for the purpose of creating joint investment projects on the territory of the Imperium of Diamonds and the interest to support the growth of the economic infrastructure of the state. Support for State Diamond Conference is always a welcome development matter the purpose, and composed of all traders, investors and processors of Diamonds from around the world. Banks in another category of its own right to exploit the Conference of the Royal Council and the development of common trades and strategies at International level and also for the expansion of new worlds and civilizations, or to do solid business cooperation in the country Imperium of Diamonds. Banks jointly acquire such rights, Financial Administration Offices ID's government as a form of Private Office with a temporary basis function under the jurisdiction of Diamond's Imperium, a form of extra-territorial, offshore or exile Office. Banks that operate Administrative Office because they can use in contact with the other banks operating authority, and thus the opportunity to expand friendly relations and trade with the rest Banks from around the world. The principle of common stock form of fund as a system ID's Temporary Office means that Banks have the right to use the ID Financial Management's for management planning and the development of its own Quartiers and Offices Banks on the territory of the state's ID. Manage ID's Finance Office is primarily an obligation to ensure oversight of limitations on the number of coins economic and financial budget of the State, and to confirm the legal handling of finances and securing a government official in the act of creating their own management teams in logistics and security arrangements. In exercising the Authorities, the Bank's own provisory right to record stable handling Cheques Imperium of Diamonds, and the legitimacy of the budget of Check accounts, until they ensure stable operation of the administrative and security printing banknotes legal basis for controlled network. In exercising the Authorities, the Bank's own provisory right to register a Registration List of ID's Businesses and also register new businesses by business interests to the legal qualification, thus extending the sales network of markets and profit potential internal movement of cooperation. In exercising the Authorities, the Bank's own right to create a provisory center trading exchanges such as the centralization strategy developed markets between dealers and thus strengthen the capacity logistically strengthen the stability of autonomous growth cycle of repeated sessions of business partners or strategically expand new markets. In exercising the Authorities, the Bank's own provisory right to record and develop business projects and organize development, while ensuring the management of development management. In exercising the Authorities, the Bank's own provisory right to record Gross Domestic Product according to the local statistics of export and import in management product with the other offices abroad, and also budget powers coins at a stable value without inflation, currency and other risks. 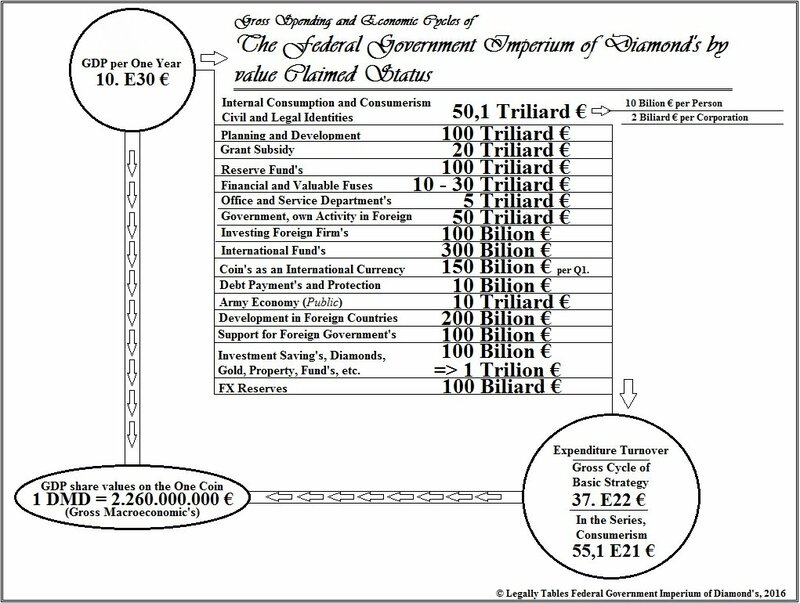 In exercising the Authorities, the Bank's own provisory right to represent the Central Bank of the Federation of Diamond's Imperium and thereby ensure the management and creation of the Central Safe, the security of transactions, the development of stable forms of ID's Central Bank operations. Management of the Central Bank therefore permits enable it to provide the right to establish deposit accounts, anonymous accounts and other financial services to clients and consumers, as the format of a joint fund between Banks which provide management Office. Banks have the right to use ID's Finance Fund for the opportunity to build their own investment projects and thus gain also profit from our joint business session. Banks must support the stabilization of government ID, when planning business projects from the budget IDs Banks act as the main strategy of the project under the principle of the UN Charter and the UNGA Declaration, as the format of International law over which there is a principle of International cooperation character. Banks must not misuse the joint relations and the rights granted to support organized crime and developing crime or infringement of any state. The administrative authority must hold a permanent contact postal address, as well as a mailing address for telex, internet server or digital system used for financial transactions and register, contact telephone, fax and e-mail. The first objective of the Bank in the exercise of government ID's Financial Authorities and Central Banks is therefore necessary to ensure that the first steps of establishing a stabilization process ID's civilization and the operation of postal functions, infrastructure, telecommunications, basic runway for airplans, excavation of wells, basic network construction, basic network of agriculture, basic network industries, basic network of energy resources, basic network of cities and urbanization, basic network of offshore platforms in international waters, the development of growth management systems civilization, as a common agreement for investment. In the event that the Bank will confirm the establishment of the office, and interoperability of financial administration and the federal government Imperium of Diamond's decision to interactively opening a financial investment check for each group according to the Bank the difference state borders, thus establishing a fund for the common market. Financial check will be written out in the amount of 1 000 000 000 000 € for building a common market in the direction of a foreign state power to each individual state bilateral form. Establishment of Administrative Authority and means creating a management staff that is based on the cooperation of a body crafted from advocacy groups of local jurisdictions, Business and Investment Analysis teams, security defense offices, team organizers of the market and also with recourse to cooperation with commercial companies to Business Mangement Services like Offshore trend for the establishment of new business corporations and facilities management. The Administrative Office is therefore based on a custom function to ensure the autonomy of their own profits and operate the official service and logistics. All payments will be allocated according to the size of responsible and rights. Representatives of administrative authority is entitled to establish its own Commission to select and hire new employees and services that this interest will support the function of Administrative Office and autonomously expand mutual benefits and partnerships. Functions of the Office of Administrative Law provides synchronization and recovery strategy for launching a Provisory ID's Offices that this interest will be established to increase political and logistical circuits ensure the management of Ministries. Each member of the Administration of Provisory Offices and their own right to become a member ID's Provisory Offices. Right-building WD Alliance owns all political parties in the world, every business corporations, all banks, associations or non-governmental organization, every movement state forms or any country's government and state from around the world, its values ​​more significant character and strength than the United Nations. Support for WD and the internationalization of a terrorist state in its right under the UN Charter, and form of our global rights for defend our safety and claims. The terrorist threat only from European Union & EU Terrorist Alliance countries, so legally open to the possibility of launching strategy global cooperation for the purpose of sanctions against European countries, as well as the recovery of damages from terrorist states. Each bank's own legal right to recover financial compensation before the Constitutional Courts your governments, according to the Central Head Quartiers at your place. Global cooperation strategy of the Constitutional Court's is an act that means our full rights at the level of global military forces, while much stronger ability to exercise judicial punishment far stronger than those named International Criminal Court UN. Common defense strategy and a global collaboration of all the Constitutional Courts of the world at umder the UNGA Declaration principles of law and the UN Charter, therefore, means that our political position is much stronger than the legitimacy of the opposition of the criminal state. Our political position becomes equal to the level and character as the World Trade Organization, United Nation's organization and Global political powers. If governments on behalf of the Constitutional Court to refuse to carry out secure justice, then this creates permissions for our party, to initiate a hard recovery restabilization government legality and ensure the legal rights, meaning the exchange of political figures who refuse to enforce legal obligations, and than start our global mobilization. The UN must always be in every direction and always fully respect our rights and interests, because our movement is the entity that owns the greatest ability to decide on the stabilization of the world and politics. The world opposition against us is legal act as bankruptcy for the United Nations policies and the loss of legitimacy by our collective ability to create our own mode of world politics, and also, for example, or unite the entire world. Losses that are neglected, and the value of the threat of crime prevents implement any strategy opposition, use Parliamentary democracy rights and global structures of security forces against terrorism, and our global economy power with public inspiration for the Global Unity of all states around the world. Start development of the International Lawyer Intelligence Council common strategy of political development, the ability to instantly create an active political infrastructure of all lawyers from around the world, thus ensuring our political superiority immediately. Commonly, we are is powerfull, than what is a power of the whole world. Today, here is upload only few information's. More information's can be upload imediately. Moje jmeno je Peter Gottwald, Kral Federalni Vlady Imperium of Diamond’s, tak zastupujici federalni Vladu Imperium of Diamond’s, dnes jako legalni formou zakladajici se vlada a statni forma na uzemi nekolikrat pozice na planete Zeme, tak stejne plnym legalnim narokem taky na uzemi mnoho dalsich planet ve vesmiru, o rozloze mnoho planet a narokovanych civilizaci, civilizace ktere jsou urceny pro rozvoj a taky mezinarodni obchodni spolupraci. Jmenuji se Peter Gottwald, a tak dnes reprezentuji novou vladu zeme v podobe federace, zeme o hodnotach vyznamnych moznosti pro vas osobni rozvoj ekonomickych strategii Vasi Banky a globalni spoluprace mezi ostatnimi Bankamy v celem svete, v brzkem budoucnu taky na dalsich planetach ve vesmiru. Federalni vlada Imperium of Diamond’s jako subjekt ktery dnes se skutecne legalni hodnotou dosahuje urovne pravni formy skutecne vyspelou ekonomiku sveta, a tak s mnoho schopnostmi pro Ekonomickou logistiku ktera je nastroj jako uplatneni Svetove Sily spoluprace vsech Bank v celem Svete, a proto dosazeni vyhry ktera znamena moznosti Spolecnych Uspechu a Sily nasi spoluprace. Moje nabidka pro spolupraci znamena vytvoreni vyhodneho a historicky vyznamneho kroku ktery je zalozeny na prvni forme skutecne Globalni Obchodni Spoluprace. Moznosti ktere jsou prinosne a prospesne pro kazdou Obchodni korporaci v celem svete, tak stejnym zpusobem se jedna o vyhodne activity pro kazdou Banku z celeho sveta, nebo pro kazdou vladu zeme. Moje nabidky mohou prinaset velky a vyznamny rozvoj a taky uspech pro mnoho vlad zemi v celem svete ktere budou podporovat nase zajmy a strategie. Tak vznika moje pozvanka pro Vase strany, reprezentaci bank z celeho sveta, moznost zahajit spolecne obchodni activity ktere se budou rozsirovat do podoby investic, v dalsich smerech nad formou spolecneho planovani civilizacniho rozvoje a taky v podobach rozsireni civilizacnich trhu ve spolupraci s poctem v podobe vetsiny obchodniku z celeho sveta, politicka skupina ktera se muze slozit z 50.000.000 obchodniku na planete Zeme. Tak stejnym formatem spolecneho vztahu je moznost uplatnit nase activity jako obchodni a standartni provoz Banky s podobou komunikace mezi klientami a korporacemi, investory a osobami zadajici o zakazku a smlouvy. 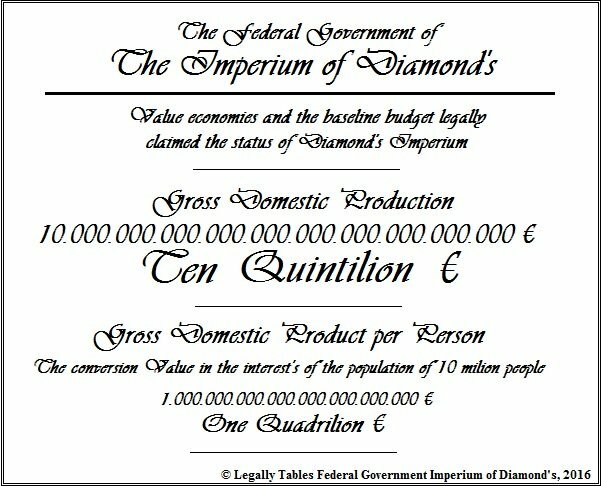 Federalni vlada Imperium of Diamond’s dnes vlastni rozvojove projekty civilizacniho charakteru ktere v prepoctu na populace 10.000.000 osob mohou dosahovat ekonomickych rozmeru 10.000.000.000.000.000.000.000.000.000.000 Euro. Cil federalni vlady Imperium of Diamond’s je zalozit globalni obchodni spolupraci a proto vybudovat Svetove Ekonomicke centrum ktere bude slouzit pro svobodu obchodu, rozvoj korporaci a bank, zajisteni vsech dobrych moznosti obchodni spoluprace a komunikace nebo bezpecnosti. Vyznamna moznost se smerem jako Rozvoj v podobe Globalni spoluprace se vsemi obchodniky z celeho sveta. Proto Federalni Vlada Imperium of Diamond’s vyuziva vlastni teritoria a legalni hodnoty ekonomicky aktivnich formatu civilizace, pro moznost rozsirit nasi globalni formu spolecnych vztahu a zalozit novy globalni obchodni retezec v podobe Globalni skupiny vsech obchodniku a bank, proto se schopnosti zalozit rozvoj novych teritorii a budovani mnoho forem novych civilizaci, aktivity ktere mohou byt v zajmu zisku ze spoluprace a obchodu velice vyznamne pro kazdou Banku v celem svete. Federalni Vlada Imperium of Diamond’s se federalnim vztahem sklada z mnoho forem legalnich subjektu ktere jsou ve smyslu ruznych a vzdalene odlisnych forem podoby politickeho systemu, tak spolecne jako clenove jednotne federace. Uzemi jako Federalni centrum, uzemi je jako subject ostatnich spojeneckych vlad, uzemi ktere je v podobe narokovanych uzemi na planete Zeme, a znovu na rozloze mnoho dalsich planet ve vesmiru, se skutecnou schopnosti okamzite podobne teritoria civilizacne vyuzivat. Federalni Vlada Imperium of Diamond’s a tak znovu specialni format teritorii ktere se zakladaji na pravech pro mezinarodni aktivitu autonomni svrchovanosti mezi vsemi vladami zemi v celem svete, nebo napriklad dalsi teritorialni subject ktery je urceny pro spolupraci vsech technologickych a vedeckych korporaci, proto s moznosti rozsirovat Technologickou civilizaci o rozmeru nekolik Galaxii a v podobe Super Skupiny Galaxii. Federalni Vlada Imperium of Diamond’s vlastni nadale subject v podobe system na urovni Korporatokracie, teritorium ktere je civilizacne slozene ze spoluprace Senatoru, Senator jako kazda osoba ktera vlastni svoji obchodni korporaci a nebo ji dale reprezentuje vlastnim jmenem. Jedna civilizace ktera je stvorena ze systemu ktery se zaklada na pravech pro spojenectvi mezi vsemi obchodniky v celem svete, proto vznika prvni a nejvetsi historicka moznost pro skutecnou Globalni Spolupraci, activity ktere se rozsiruji na urovni vyspelejsi nez nase planeta Zeme, alespon 1.000.000.000.000.000.000 planet ve vesmiru, nekonecny zdroj surovin, nekonecny zdroj volne plochy pro rozvoj, tak taky mnoho vyznamnych zdroju a moznosti pro rozvoj. K dosahu forma okamzite moznosti spoluprace a komunikace mezi jakoukoliv korporaci z celeho sveta. Dnes, nejlepsi strategie pro spolupraci v zajmu kazde obchodni korporace, tak stejne v zajmu kazde Banky na nasi planete. Korporatokracie jako statni forma znamena pro kazdou obchodni korporaci a banku, schopnost opravdu Vyznamne moznosti pro pokrok a drtive predstihnout jakykoliv rozmer konkurence v celem svete. Teritorium se vsemi obchodnimi trhy z celeho sveta, vysoke obchodni aktivity, logistika prostrednictvim vsech svetovych korporaci a obchodniku, komunikace mezi svetovymi organizacemi a centry obchodu, schopnost se rozvijet za pomoci vetsiny patentu a autorskych prav v celem svete a proto moznost neomezenych projektu a strategii, predstihnuti vsech hodnot lidskeho sveta, to je Vlada Korporatokracie. Dnes nejvice dulezity krok pro Vase Investice a spolupraci. Federalni vlada Imperium of Diamond’s vlastni mnoho forem teritorialnich subjektu ktere se rozsiruji se zajmem o globalni spolupraci a nebo formu obchodniho a investicniho charakteru. Napriklad Mezinarodni Aliance World Diamond, mezinarodni autonomie s pravem pro spolecnou svrchovanost mezi vsemi vladami zemi na nasi planete, idealni misto pro zalozeni aktivit vasi banky a tak rozsireni vasi spoluprace na mezinarodnim trhu, primo mezi vsemi vladami zemi v jeden moment. Rozvoj globalne jednotne civilizace ktera je otevrena pro kazdeho cloveka z celeho sveta, hodnota HDP celeho rozsahu WD ekonomiky je rovnocene rozdelena mezi vsechny vlady zeme jako cleny v Alianci WD, tak vznika civilizace ktera se zaklada na sile ekonomiky ktera je podporovana od vsech vlad zemi na nasi planete, brzy v budoucnu jako svetove centrum Globalni Ekonomiky a kooperacni aktivity. Vsechny Vlady zemi a specialni autonomie World Diamond se sklada z naroku kazde vlady zeme pro prirozenost prava jako zasedatel a spolecna svrchovanost. Mezinarodni teritorium jako Civilizace celeho sveta a vsech narodu, jedna vyznamna civilizace ktera brzy bude o rozmeru pres nekolik 15.000.000.000.000 planet ve vesmiru, hodnota za 4 Galaxie jako podoba budouciho zakladu infrastruktury jednotne civilizace. Misto ktere je urcene pro sjednoceni vsech politickych komunit, politickych stran, hnuti a agentur, do jedne skupiny stejneho charakteru svobody slova, svobody spoluprace a rozvoje, svoboda obchodu a soucasne rozsireni vsech zakladu miru a politickych odpovednosti, a v tomto pripade moznost uplneho uplatneni globalni strategie jako jedna skupina Globalne Sjednoceneho Charakteru s vyznamnou hodnotou na urovni mezinarodni politiky, obchodnich a rozvojovych strategii, stejnym zpusobem na poly svetove bezpecnosti, tak hlavne v zajmu budoucnosti celeho lidstva. Banky z celeho sveta maji pravo zde spolecne rozsirovat vlastni activity a planovat spolecne rozvoj a strategie, nebo politickou prezentaci, navrhovani novych pravidel. Tak moje nabidka pro nasi prvni spolupraci, moznost vytvorit vyznamne investice a zisk, vyuzivat konta s vyznamnymi hodnotami, nebo se rozvijet prostrednictvim spolecneho organizovani trhu. Jedna z dalsich hodnot Federalniho vlastnictvi Imperium of Diamond’s je napriklad Technologicka Civilizace Imperium of Diamond’s, sidlo vsech Korporaci ktere se zakladaji na aktivite v obchodnich kategoriich jako je Technologie, Veda, Matematika, Inzenyrstvi, dalsi jine charaktery tohoto typu. Technologicka Civilizace se zaklada na naroku teritorii o rozloze pres jednu super skupinu Galaxii, a tak v zajmu jen technologickych aktivit, a rozvoje. Hodnota takove civilizace se proto muze zakladat nad vyznamnym pomerem ktery presahuje vsechny rozmery hodnot nasi planety Zeme, proto se aktivita znovu stava jako jeden z nejvice vyznamnych ekonomickych projektu v historii celeho lidstva a nasi budoucnosti. Mnoho Bank v celem svete proto vlastni vyznamnou moznost podporit svoje klienty a sdilet investice, vyuzit mnoho investicnich projektu a rozsirit svuj rozhled a rozsah, strategii mezinarodniho dosahu a uspesnost, odolnost proti konkurenci, schopnost vyuzivat trhy v podobe aktivit v jinych svetech a specialni hodnoty v plnem mezinarodnim charakteru. Otevreny novy Svet a vyznamne moznosti spoluprace, predstihnuti podstaty lidske rasy a nasich civilizaci. Spoluprace v zajmu Technologicke civilizace je velice uspesna a zalozena na skutecne vyznamnych hodnotach ekonomickeho charakteru. Dnes je to uz skutecne, ze hlavni hodnoty a dulezitost budoucnosti lidstva jsou zalozeny na nasi schopnosti vyuzit technologie, to znamena uspesnost Technologicke civilizace, v budoucnu jako nejvice dulezita zeme v celem svete. Federalni vlada Imperium of Diamond’s se zaklada na schopnosti skutecne vytvorit velky pokrok a rozvoj ktery je velkym prinosem pro cely lidsky svet. Spoluprace vsech Korporaci znamena schopnost nasi skutecne a vyznamne formy uspechu, rozvoj celeho rozmeru lidskeho sveta, zaroven taky rozvoj pro Federalni Vladu Imperium of Diamond’s a pro kazdeho kdo podporuje. Federalni Vlada Imperium of Diamond chce rozsirit spolupraci s ostatnimi vladami zemi v celem svete, tak stejne s dalsimi jinymi subjekty v podobe bank, korporace, politicke strany a taky organizace nebo komunity a hnuti. Hlavni cil Federalni Vlady Imperium of Diamond’s je diplomaticky sjednotit cely svet a podporovat kazdy narod, podporovat kazdy stat a dobry zajem. Proto, moje nabidka je podporit Vase aktivity a zalozit nase spolecne pratelstvi a spolupraci ve smeru obchodu, rozvoje a civilizacni planovani. Aktivity v podobe Globalni spoluprace mezi vsemi Bankami v celem svete a rozsireni dobrych vztahu tak se strategii vyznamne spoluprace obchodniho aktu ktery pro kazdou z bank v nasi spolupraci znamena schopnost udrzet svoji obchodni a ziskovou pozici na urovni vysoke relace konkurujici mezinarodnimu pomeru podle hodnot novych moznosti a nabidek rozvoje nebo podle rozmeru soucasne situace, tak proto ja nabizim vyznamnou silu pro nasi spolupraci, akt ktery znamena vytvoreni Globalniho Spolku z ucasti vsech Bank v celem svete a proto moznost dosahnout velkeho rozvoje kariery Vasi banky, vyznamne moznosti pro dosazeni vrcholneho uspechu globalniho rozmeru a tak podporit rozvoj vasich trhu, trhu ostatnich vlad zemi a zisky pro vase klienty, zisky ktere pro vasi banku mohou soucasne zajistit vyznamne jistoty kazde stability i pri nejhorsich formach svetove financni krize. Federalni Vlada Imperium of Diamond’s je subjekt ktery se zaklada na veskere hodnote skutecne vlady zeme jako subject s narokem vyuziti skutecnych politickych prav a zasad, aktivit a mezinarodniho formatu spoluprace. Proto Federalni Vlada Imperium of Diamond’s chce rozsirit nase vztahy a zalozit na spolupraci ktera pro Vase Banky vytvari pravo pro soukrome a spolecne organizovane activity v teritoriich urceneho smeru Federalni rozlohy Imperium of diamond’s, tak moznost zakladat obchody, trhy, organizovat se a rozvijet sily, podporovat globalni vztahy s ostatnimi Bankami, moznost se rozvijet na mnoho formach specialnich projektu Interniho a Mezinarodniho, nebo primo Globalniho charakteru. Imperium of Diamond’s je subject typu Federalni vlady ktera vlastni a legalni hodnotou vyuziva svoje teritoria s plnou hodnotou moznosti pravniho vyuziti politickou formou, stejne tak je ve vlastnostech Imperium of Diamond’s schopnost vlastnit populace a spotrebitele v podobe mnoho forem aktivnich subjektu, podle legalne uznatelneho registru se dnes skutecne jedna o hodnotach kolem 2.000.000.000 lidi jako registrovani spotrebitele a s dalsi vyznamnou schopnosti brzy vyuzivat specialni technologie ktere mohou znacne zvisit hodnoty populacniho vykonu. Federalni Vlada Imperium of Diamond’s tak soucasne vlastni activity politickeho charakteru, activity v podobe rozsirovani jurisdikce, planovani rozvoje civilizace, ekonomicka sprava nebo planovani, legislativa a dalsi podobne formy svrchovanosti. Tak jsou vytvareny projekty a jejich system, v souladu s prirozenymi zasadami trhu a obchodu, podle spravedlnosti a moznosti dobreho rozvoje. Vznikaji tak obchodni trhy a obchodni moznosti ktere se transformuji do podoby uspesnych moznosti ktere mohou rozvijet vyznamna centra obchodnich aktivit ktere v zajmu relaci k mezinarodnimu pomeru mezi Bankami v celem svete, tak pravidla a moznosti obchodnich struktur ktere mohou zajistit dobre uspechy a vyznamny rozvoj sily obchodniho formatu nebo styku a multy obchodnich a politickych aktivit. Imperium of Diamond’s, misto ktere je pro vas urcene jako subject v zajmu ktereho je moznost se soukrome rozvijet a rozsirovat vlastni styky, kontakty a nebo podporit rozvoj civilizace. Korporatokracie, teritorium a legalni forma statu ktera je dnes nejvice dulezitou strategickou pozici pro kazdou obchodni korporaci v celem svete, stejne tak pro kazdou Banku. Imperium of Diamond’s je dnes legalnim narokem politickeho charakteru vlada s uznanim jako Nezavisla Vlada s narokem pro vyuziti sveho statutu jako skutecny politicky subject s pravy pro management civilizace a takove activity mezinarodniho jednani vlastnim jmenem legalni entity. Proto je v plnem rozsahu znovu legalnim subjektem jako uznany stat, napriklad vlada Korporatokracie, hodnota jako globalni centrum svetoveho charakteru a mezinarodniho hnuti vsech obchodniku a korporaci v celem svete, nejvice vyznamna civilizace v historii lidske existence, soucasne moznost pro aktivity podle vlastnich pravidel a zasad obchodniho retezce nebo spoluprace mezinarodniho charakteru, komunikace a uznani vlastnich systemu jurisdikce, teritorialnich aktivit, mnoho forem civilizace a nebo mezinarodnich vztahu a odpovednosti. Federalni vlada Imperium of Diamond’s proto nabizi moznost pro kazdou Banku v celem svete, nezavisly krok, schopnost svobody proti soucasne pozici a moznost zajistit si vzdy stabilitu, schopnost zalozit mnoho novych svetu, vytvoreni activity pro obchodni rozvoj v teritoriich Korporatokracie, na dalsich planetach, spolecne zapojit se do spoluprace a rozvoje, vytvaret spolecne cile, vyuzit jedinecne nabidky pro spolupraci a tak zalozit vlastni Bankovni pobocku na uzemi Federalni Vlady Imperium of Diamond’s a v tom pripade moznost zacit vyznamne a dynamicky podnikat, podporit rozvoj civilizace Imperium of Diamond’s a v tom pripade zalozit taky spolecne trhy, nebo podporit rozsireni trhove sily na uzemi dalsich vlad zemi v zahranici a v tom pripade posilnit historii lidstva o dalsi nove vyznamne vztahy svetove politiky a takoveho charakteru, moznost pro nasi skutecnou Globalni spolupraci ktera znamena nase spolecne sily ve schopnosti transformovat mezinarodni obchodni trend, retezce, standardy a naroky s pravem, podle naseho spolecneho zameru a povinnosti strategie se spravedlnosti. My spolecne dokazeme vyuzit mnoho legalnich aktivit a nabidek Imperium of Diamond’s, moznosti ktere pro nas a vasi skupinu mohou vytvorit rozsahle pozice mnoho strategii a tak soucasne v podobe Globalniho uplatneni a vykonu. Kazda Banka proto vlastni narok otevrit vlastni pobocku ktera proto bude reprezentovat jmeno banky, kontakty na banku, prava banky, majetky banky a organizacni strukturu Banky. Banka v tomto pripade bude rozsirovat activity spoluprace s ostatnimi a prostrednictvim svych strategii financnich investic rozvijet strategie obchodu a rust civilizace, uplatneni internich a mezinarodnich projektu ktere jsou urceny pro nas hromadny a globalni rozvoj. Zisk ze spoluprace je vyznamny a v hodnotach politickeho formatu. Kazda Banka muze do spolecneho rozpoctu ziskat hodnoty ktere jsou skutecne vyznamnejsi nez Hruby Domaci Produkt ekonomiky na planete Zeme. • Prima Pobocka, jako Dum s Adresou. • Prima pobocka, jako formalnim registrem z duvodu specialni situace. Banky ktere zalozi svoji vlastni pobocku v teritoriich Korporatokracie proto vlastni vyznamnou sanci v podobe velke moznosti ktere znamenaji pravni moznost pro vytvoreni rozsirene investicni aktivity a nebo plnou obchodni a strategickou spolupraci se vsemi korporacemi v celem svete, tak ihned z jedne pobocky na uzemi Korporatokracie. Uzemi Korporatokracie je proto se zalozenim na hodnote ktera znamena schopnost ziskat jakykoliv produkt z rozsahu celeho sveta. Vsechny druhy obchodnich surovin, spoluprace z jakekoliv obchodni pozice na nasi planete, smenu mezi mnoho staty v celem svete, predpoved ekonomiky z globalnich informacnich aktivit, schopnost pres korporace organizovat manipulaci vetsiny existujicich patentovych prav, vsechny druhy autorskych prav a tak soucasne vsechny druhy obchodnich aktivit z celeho rozmeru nasi planety Zeme. To je nejvice idealni pozice pro rozvoj kazde banky, pozice ktera je vyhodnejsi nez jakakoliv jina pozice na nasi planete Zeme, nebo napriklad dnes Vase soucasne sidlo a takove strategie. Nase spoluprace muze zacit na mnoho formach aktivit, napriklad zakladnim faktorem je sdileni spolecneho zajmu mezi blizkymi Bankami a Obchodnimi partnery ve vasem okruhu, a tak i s moznosti vyuzit strategii vlastniho rozvoje, zakladat kooperacni strukturu mezi korporacemi a bankami v celem svete, informace jsou hodnotna surovina a proto je dobre informace sdilet mezi strategickymi obchodniky nebo prostrednictvim informaci a udelenych prav tak rozsirovat vlastni pozice na svetovem trhu. Moje nabidka pro Vas vytvari moznost rozvijet se mezi obchodniky, vyspelimi svetovimi korporacemi, mezi dalsimi jinymi subjekty v podobe Bank a Vlad zemi. Proto ja nabizim pro vas mnoho vyznamnych moznosti ktere mohou skutecne posilnit base budouci kroky a jistoty, vytvorit novou strategii a aktivitu o budoucnosti celeho lidstva a svetovych trhu, novy prevrat ktery je pro kazdeho z nas opravdu vysokym prospechem posilneni hodnot celeho lidstva. Prospech ktery je urcen pro mne, pro Vas a Vase Banky, tak i pro kazdou Korporaci v celem svete, uspech ktery z Vasi Banky dokaze vytvorit dominantni subject na mezinarodni urovni. Za to, ja chci poprosit Vasi stranu, o moznost podpory ktera je prinosna pro kazde z nasich stran, podpora jako aktivita ve sdileni strategie pro nas rozvoj. Ja chci poprosit Vase Banky o moznost spoluprace pro kontaktovani ostatnich obchodniku a korporaci v celem svete, predani informaci o Korporatokracii a tak spolecne activity pro rozsireni spolku o rozmer v podobe dalsich aktivnich Clenu, vytvoreni skutecne globalni sily ktera bude vyznamna a velice silna, konkurence proti jakekoliv nasi opozici. Nase hodnota vyznamnejsi sily pro nas prinasi schopnost samostatnosti a vyznamne vyspelosti, sila ktera pro nas znamena jistotu uspechu nasich kroku ktere budou urceny pro rozvoj mnoho dalsich civilizaci na dalsich planetach ve vesmiru a zakladani novych svetu, svety ktere jsou ekonomicky vyhodnejsi nez rozsah sveta planet Zeme. Korporatokracie je uzemi ktere patri pro kazdeho z Vas, pro Kazdou Banku v celem svete a proto muze Vase Banka vyuzit techto vyznamnych historickych moznosti. Je dobrou volbou zahajit rozvoj napriklad obchodni nabidky pro Vase Klienty, Korporatokracie je subject ktery vlastni plan pro rozvoj na urovni Super Skupiny Galaxii, 1.000.000.000.000.000.000 planet ve vesmiru, nekonecno surovinovych zasob a plocha ktera je urcena na rozvoj civilizace za obdobi vice nez nekolik milliard roku. Kazdy Vas klient bude stastny za Vase nabidky ktere budou podporovat jeho obchod, kazdy obchodnik vlastni automaticky vsechny prava pro rozvoj vlastnich obchodu na uzemi Korporatokracie, korporatokracie soucasne uznava prirozeny system a narok pro drzeni autorskych prav a strategie obchodu. Vase Banka proto dokaze zahajit rozsireni vlastnich trhu ktere budou soucasti Korporatokracie, proto spolupraci mohou zahajit taky Vasi klienti a Korproace, kazdy kdo bude ochotny nebo vyhodny. Pokud Vase Banka dokaze vymyslet dobre trhy, Vase Banka proto ziska vyznamnejsi schopnost pro uspech mezi klienty a spolecenskou I obchodni oblibenost. Klienti ve Vasi Bance mohou byt velice poteseni za Vase aktivni styky a podporu pro skutecny rozvoj spolecneho pratelstvi na urovni klientelismu, s inteligenci a prekvapenim, I s milim pozdravem, pro budoucnost vaseho klienta a soucasne pro dosazeni cile vlastni pozice jako svetove nejvice vyznamny ekonomicky subject na urovni globalni struktury. Moznost vyuzit takovou prilezitost je jednoducha. Je dobry krok uvedomit vase obchodni okoly, dalsi klienty Vasi Banky, specialni klienty Vasi Banky, korporace ve vasem okoly a nebo dalsi korporace ktere podporuji vlastni aktivitou ekonomickou silu trhu ktere vyuziva vase klientela. Informace Korporatokracie je skutecne silna surovina ktera muze zmenit mnoho skutecnych predpovedi o ekonomickem a obchodnim vysledku, a je vyhodne takovou surovinu rozsirit v globalnich mediich, kazda z Bank vlastni pravo pro predstaveni v mediich vase obchodni nabidky spoluprace, vase zajmy o investice, vase zajmy o zakladani novych pobocek a nebo pro rozvoj ostatnich forem prirozenych trhu. Je proto vyhodne zakladat taky konferenci schuze s obchodniky a s medii, s reporter a s dalsimi osobami. Proto Vase strana dokaze vyznamneji rozsirit vlastni silu a tak ziskat uspech, vyznamnejsi budoucnost Vasi pozice. Je dobry krok a strategie, vyuzit vasi schopnost pro zakladani konferenci, zakladani spolecnych aktivit a nebo kontaktovani se v zajmu vytvoreni vlastni kolonie korporaci a obchodniku kteri chteji rozsirit silu multy investice, spolecne zbohatnout a ziskat vyznamny krok vpred. Vsechny Korporace z celeho sveta maji moznost se stat clenem Korporatokracie, to znamena jejich schopnost pro vlastni rozvoj korporace prostrednictvim vyspele site obchodniku a svetovych korporaci, a tak aktivne se podilet na rozvoji civilizace ktera predstihne hodnoty maximalniho uspechu nasi lidske rasy od doby naseho vzniku. Je skutecnost, ze vase investice a organizacni pomoc pro klienty Vasich Bank, a pro obchodniky, to je opravdu vyznamna moznost a vyhodna sila. Je Pravda, ze Vasi klienti spolecne mohou skutecne vyuzit vyznamnejsich sil obchodu ktery bude zalozeny na svetove siti obchodniku, a my proto vyuzijeme situace globalni spoluprace a trhove site kterou my dokazeme tvorit civilizace s rozlohou nekolik milionu planet, a mnohem vice, my spolecne dokazeme predstihnout vsechny hodnoty uspechu dnesni lidske rasy a je opravdu skutecnosti ze my tak spolecne dokazeme vytvorit velky a vyznamny stat, uzemi a globalni vladu ktera bude schopna rozhodovat o nejvice dulezitych zasadach ekonomickeho sveta, a hlavne o budoucnosti cele svetove politiky. Takove jsou dnes otevrene dvere pro investice Vasi Banky a Obchodniku, klientu a korporaci z celeho sveta. Investicni narok pro spolupraci v zajmu rozvoje Korporatnich Kolonii, investicni pravo pro rozvoj korporaci a zakladani uradu pro logistiku v zajmu rozsireni kolonialnich siti trhu, nebo logistika pro rozvoj site trhu na dalsich planetach. Zisk z Vasich Investic bude v kazdem pripade vyznamny, a pro vasi Banku dokaze umoznit silu a schopnost se rozvijet na dalsi level, pokracovat v nasi spolupraci I na uzemi dalsich planet ve vesmiru, v zajmu nove ekonomiky ktera predstihne hodnoty svetoveho obchodniho rozmeru. Vlada Korporatokracie, Federalni Vlada Imperium of Diamond’s, dnes jako nejlepsi strategie pro investice a obchodni spolupraci. My jsme budoucnost svetoveho obchdou a rozvoje, strategie a politiky. Korporace ktere budou chtit spolupracovat proto mohou vyuzit mnoho forem pro nase spolecne zacatky spoluprace, napriklad activity v podobe investice do vzniku prvni korporatni pobocky na uzemi Imperium of Diamond’s, nebo v zajmu kolonie na uzemi Rockal, Bir Tawil a nebo v Extrateritorialni zone. Kazda Banka v celem svete vlastni pravo pro rozsireni vlastnich nabidek o investici do activity Korporatni Kolonie prostrednictvim prezentace statnich nabidek pred ostatni obchodni spolky, korporace, obchodni conference a forum, centra obchodu a pred burzami, informace o Korporatokracii a vyhody z takove spoluprace. Kazda Banka z celeho sveta vlastni narok zakladat v uzemi Korporatokracie, novou vlastni pobocku Vasi banky a proto zahajit spolecne obchody a nebo jine formy obchodniho sjednoceni se mezi ostatnimi Bankami a Korporacemi. Kazda Banka proto ma narok na debaty politickeho charakteru a zasedani se ostatnimi obchodniky v Korporatnim Senatu, rozsirovani spolecnych projektu a strategii obchodu, rozvoje prumyslu a civilizace, zakladani novych trhu a strategie makroekonomiky, tak I ve stejnem zajmu je ve vasich pravech narok pro vyuziti spolecnych aktivit v podobe rozsireni mezinarodni komunikace a navrhovani mezinarodnich prav pro obchod. Brzy bude nase spolecne hnuti zalozeno jako subject ktery vlastni narok pro prezentaci pred Svetovou Obchodni Organizaci a nebo pred dalsi vyznamne obchodni a business korporace mezinarodniho pomeru. My jsme spolek ktery se automaticky zaklada na sile v pomeru globalni hodnoty vsech obchodniku na celem svete, to znamena ze my jsme spolecne vyznamnejsi sila nez dnesni svetove obchodni organizace. My jsme proto budoucnost Svetoveho obchodu. V kazdem pripade je jistotou ze Vase Banka tak dokaze ziskat mnoho strategii jak posilnit vlastni pocet klientu a vlastniku aktivnich uctu ve vasi Bance, nebo jine osoby formou obchodnich veritelu. Vase Banka tak ziska vyznamnou spolupraci na mnoho projektech ktere budou otevreny pro cely svet. Projekty pro stavby mrakodrapu, spoluprace pro stavbu infrastruktury, vyznamna spoluprace pro stavbu modernich technologii, spoluprace pro rozvoj obchodnich korporaci a kolonii, nas cil bude taky vybudovat velke kosmicke kolonizacni lode. Korporatokracie vlastni mnoho forem ekonomickych projektu a cilu ktere jsou schopne zajistit pro kazdou banku v celem svete opravdu vyznamne financni zisky a premie. Federalni Vlada Imperium of Diamond’s nabizi moznosti pro rozvoj prvnich obchodnich aktivit v podobe kolonie ktera muze spojit mnoho obchodniku a Bank, kolonie ktera je jako start ve Politicky Legalnich teritoriich Imperium of Diamond’s. Prvni kolonie na uzemi Bir Tawil, dnes legalne vlastnene uzemi. Pozvanka pro zalozeni kolonie, nebo primo vlastni pobocky v formalnim uzemi jako statni podnik, potom je opravdu moznost vyuzit brzy spolupraci mezi mnoho korporacemi z celeho sveta, spoluprace mezi obchodniky kteri zalozi jen zakladni pobocku, kontaktni centrum a urad pro moznost zakladani spoluprace spolecnych strategii ktere jsou schopny vyuzit nasich spolecnych sil, zakladni silu obchodni activity a produkce, proto ihned se schopnosti se organizovat mezi ostatnimi obchodniky a rozsirovat vlastni pobocky, offshore pobocky a korporace, prumysl, zemedelska centra, silu dalsich obchodnich odvetvi a tak vytvoreni kroku ktery znamena zisk mnoho novych svetu. Teritorium Bir Tawil je uzemi mezi Egyptem a Sudanem. Teritorium je od roku 1998-2000 jako legalni uzemi federalni Vlady Imperium of Diamond’s a tak s moznosti pro nase organizovani se pod svobodnou aktivitou podle zasad politiky Korporatokracie, demokracie vsech obchodniku v celem svete a se svolenim od Krale Imperium of Diamond’s. Teritorium Bir Tawil je geograficky jen sucha puda, nedostatek vodnich zdroju, zadne rostliny a zver, vysoke teploty, pisek a skaly. Federalni vlada Imperium of Diamond’s vlastni dostatek strategickych projektu a technologickych sil pro vybudovani okamzite schopnosti plneho zasobovani vodnimi zdroji, vytvoreni klimatizace prostredi, zajisteni vsech zemedelskych surovin, vytvoreni civilizace ktera v prubehu rozvoje kolonii bude na urovni vyspele vlady zeme a skutecne mohu potvrdit ze ekonomika Bir Tawil dokaze prostrednictvim rozvoje Imperium of Diamond’s, dosahnout na uroven HDP v pomeru 10 Kvintilionu Euro za cely rok. Rozvoj vodni infrastruktury bud emit ihned zpetny zisk v hodnote pres 40.000.000.000.000 Euro, to je silnejsi hodnota nez HDP v USA, v Chine, v Japonsku, nejvice ekonomicky dominantni zeme. Vase Banky taky mohou vyuzit takove prilezitosti a proto zahajit investicni a logistickou spolupraci pro rozvoj civilizace Bir Tawil, soucasne v zajmu spoluprace pro rozvoj prvnich kolonii. Federalni vlada Imperium of Diamond’s bude brzy vyuzivat vyznamne systemy rozvojoveho management ktere mohou z uzemi Bir Tawil skutecne vytvorit uzemi ktere se ekonomickym formatem dokaze srovnavat s vice nez jen s nejvice vyspelimi zememi v celem svete, prvni krok je proto zajisteni vznik Korporatnich Kolonii ktere budou nasledne preneseny na uzemi Korporatokracie, jine Galaxie ve vesmiru. Kolonie ktere budou vyuzity pro spolecnou produkci kosmickych lodi pro galakticke cestovani, robotika, zemedelske farmy, orbitalni a levitujici lode, technologie pro vedecke a prumyslove aktivity, zdravotni centra a nebo ostatni jine formy obchodnich aktivit. Prvni kolonie muze byt zalozena kdykoliv, vznik vsech dulezitych technologii a odcestovani na dalsi planet muze byt uspesny ihned do tri tydnu, mozna dva mesice. Ekonomicky obrat v uspesne hodnote. Proto je vyhodnou moznosti, vyuzit Korporatokracii jako silu pro prilakani dalsich klientu a rozsireni hodnoty vlastnich investic a jejich zisku, zajisteni spoluprace ktera znamena schopnost vlastniho rozvoje a rozsireni vasich pobocek I organizacnich aktivit na uzemi dalsich planet ve vesmiru. Vase Banka, prostrednictvim potvrzeni vasi spoluprace proto ziskavate specialni moznosti. Nase spoluprace se zaklada na globalnich aktivitach a komunikaci, rozsirovani organizacnich strategii a pohyb v rozmeru pravidel svetove politiky. Nase activity budou brzy presunuty na uzemi Bir tawil, proto je skutecne ze je slozite vyuzit pristup do zeme a organizovat rozvoj mezi obchodniky. V takovem pripade, kazda Banka vlastni narok pro ziskani Legalni hodnoty s pravem pro organizovani rozvoje tovarny na specialni letajici transport, transport ktere mohou letat s rychlosti pres 50.000 kilometru za jednu hodinu a do urovne Orbitalni linie kolem nasi planet zeme. Kazdy Vlastnik a Tym Banky ktery bude podporovat kroky Korporatokracie, investment do rozvoje Bir Tawil, nebo jine ostatni zajmy v podobe spolecneho obchodu, vedeni Banky a Rada tymu pro nasi spolupraci a organizovani se proto automaticky ziska narok pro vlastneni sveho osobniho vozu pro pracovniky, a hodnotu vozu zaplati Centralni Banka Federalni Vlady Imperium of Diamond’s. Vozy ktere mohou levitovat budou prvni vyrabene na uzemi jineho staty, alespon zakladni produkci pro schopnost materialoveho transport, pres Orbitalni drahu, z jakekoliv pozice na nasi planete a bez povinnosti platit celne na hranicich nebo se prokazovat Vizem, Orbitalni prostor je svobodna zona bez politicke activity jakekoliv vlady zeme. My proto muzeme zajistit schopnost dovozu jakychkoliv material na uzemi Bir Tawil, my proto dokazeme zajistit vytvorit silu ktera znamena vytvoreni skutecne nezavisle civilizace a schopnost rozvoje pro vsechny kolonie. Korporatokracie Vlada bude v prvnich zacatcich rozsirovat kolonie na uzemi Bir Tawil, tak s moznosti na uzemi Rockal v severnim Atlantiku, nebo napriklad Extrateritorialni kolonie na uzemi jinych vlad zemi, kolonie ktere jsou urceny pro moznost vybudovani dalsi specialni technologie se zamerem pro schopnost okamziteho cestovani na uzemi dalsich planet, v dalsich Galaxiich. Proto, je moznost vytvorit mnoho novych svetu a jednoduse cestovat mezi vesmirem, ziskavat mnoho surovin a rozsirovat vlastni trhy, mesta, civilizace, nase vlastni centra obchodu, proto je v kazdem pripade moznost regulovat taky nas zisk a tak rozvijet strategii rozvoje, dosahnout na vyznamnejsi uroven. Firmy a korporace ktere budou podporovat nas rozvoj se proto mohou ihned rozvijet prostrednictvim centralni spoluprace s koloniemi na uzemi Bir Tawil, a proto bude nase spolecna sila schopna podporit kazdou korporaci ktera zalozi jen zakladni rozvojovou pobocku a kontaktni centrum. Nase schopnost bude vyuzivat nase soukrome zdroje surovin a technologii, prumyslovych center, spolecna politika vladni ekonomiky pomuze pro kazdou korporaci se rozvijet a proto Vase Banky mohou znovu ziskat mnohem vyznamnejsi schopnost zahajit dalsi investicni a obchodni spolupraci, planovani logistiky a rozvoje, vlastni nezavislost a vyznamny zisk. Nase globalni spoluprace znamena schopnost vyuzivat specialnich prav Federalni vlady Imperium of Diamond’s. Pravo jako narok pro Extrateritorialitu, tak system jako politicka imunita ktera vznikla na zasade mezinarodnich pravidel a system povinnosti OSN, dalsich jinych bezpecnostnich a politickych organizaci. Imperium of Diamond’s prave dnes vyuziva legalni pravo vlady jako samostatny subject s teritorii Bir Tawil, Rockal, dalsi jina specialni a legitimni mista. Imperium of Diamond’s vsak v obdobi nekolika roku zpet s donucenim bylo ztraceno na civilizacni schopnosti activity a v takovem pripade dochazi k situaci kdy vlada je oznacena jako exilova vlada s aktivitou uradu na uzemi jine vlady zeme. Situace ktera dosahuje rozmeru svetove politicke zalezitosti a tak soucasne na urovni svetoveho rozmeru mezinarodnich politickych pravidel ktere v tomto pripade davaji narok na vyuziti naroku politicke imunity jako extrateritorialitu na kazdem uzemi vlady ktera je legitimnim clenem OSN. Proto je skutecnost, ze kazdy obchodnik ktery potvrdi vlastni zajem o activity v zajmu korporatokracie, kazda z Bank, jakakoliv jina osoba, proto kazdy ihned ziskava legitimni narok pro vlastneni a vyuziti prava o extrateritorialite na uzemi 193 vlad zemi v celem svete, tak vznika extrateritorialni uzemi o rozmeru plochy drtive vetsiny celeho sveta a schopnost bez platby a rozsahle prohlidky kontaktovat ostatni osoby na hranicich vlady, kazdy z nas proto dokaze vyuzivat cely svet jako jedno velke a vyznamne uzemi, otevreny svet ve kterem je legalni moznost kontaktovat a podporit jakoukoliv korporaci, zahajit obchody a rozsirovat spolecnou globalni strukturu obchodnich trhu a extrateritorialnich kolonii ktere budou slouzit pro moznost odcestovani na uzemi dalsich planet ve vesmiru. Podle politickeho naroku apovinnosti mezinarodnich pravidel, pravo pro extrateritorialitu bude ukonceno ihned kdyz bude zahajena skutecna funkce prvnich teritorii Korporatokracie, a vsechny osoby ktere potvrdili vlastni zajem o aktivitu, kazdy potom musi potvrdit svoji schopnost a svobodny pristup k teritoriim Korporatokracie. Nase spoluprace tak dokaze v zajmu vasich strategii zajistit proctor v rozsahu celeho sveta, moznost kontaktovat jakoukoliv korporaci a schopnost se v extrateritorialnim rozsahu obchodne rozvijet podle svobodnych pravidel federalni Vlady Imperium of Diamond’s. Kazdy kdo bude reprezentovat trhy a podporovat takove organizovani proto automaticky ziska letajici osobni transportni auto jako darek z nasi produkce. Turisticky Organizator vlastni narok pro vyuziti formalniho prostoru Extrateritorialni formy uzemi Imperium of Diamond’s Jurisdikce a aktivit, proto rozvijet obchody a management obchodu, activity podle pravidel proti inflaci obchodu a meny. Kazdy Turisticky Organizer proto dokaze vyuzuit formalin activity pro zalozeni vlastni obchodni korporace na uzemi Imperium of Diamond’s a nebo se spojit pro rozvoj obchodnich aktivit. Dnes, hlavni investice jsou potrebne jen pro moznost vzniku Uradu Aktivni Vlady ktera bude aktivni na urovni extrateritorialni pozice, nezavisly subject na svetovem okoly, nebo kontaktni centrum v podobe mista pro nase conference, zasedani a spolecne srazy, prezentace pred publikum. Prvni centrum muze byt otevrene na Bir Tawil, dalsi centrum muze byt otevrene v dalsich zemich na celem svet, nebo nase spolecna komunikace muze probehnout prostrednictvim digitalni kryte komunikace a nebo v podobe spolecne schuzky ktera muze byt vytvorena s pomoci mezinarodnich organizaci a taky prostrednictvim spoluprace s dalsimi instituty a organizacemi pro obchod, Evropska obchodni komora, centrum Svetoveho obchodu, konferencni centra Bank, mnoho prostoru. Nase spolecna obchodni aktivita znamena nutnost zamestnat nekolik osob, uradujici osoby ktere budou schopny provadet komunikaci, kontaktovani dalsich korporaci, kontaktovani dalsich vlad zemi a nebo bank, vymera investic a obchodnich relaci s moznosti rozsirit trhy na iru potrebnou k usopechu a soucasne vyuzit krok pro globalni organizacni stabilitu. Vase Banka muze podat taky investice pro zalozeni logistickeho uradu na zpusob Outsourcing identity, urad ktery bude fungujici jako politicka forma pro organizovani dalsich rozvojovych kroku obchodu a sluzeb, zakladani kolonii a politickou komunikaci, komunikace mezi obchodniky. Vas zisk z vytvoreni uradu muze znamenat ihned 100% zpet a jistoty pro moznost dosahnout na uroven staleho partnera v zajmu Korporatokracie Vlady Globalni activity. Zakladni aktivita Uradu bude rozvoj management strategie obchodu na trzich ve formatu odkup surovin od prvni firmy, zpracovani surovin u druhe firmy, a prodej prostrednictvim dalsi korporace. Obchodni system spoluprace muze byt taky zajisteny na vyuziti trznich aktivit mezi outsourcing korporacemi ktere zalozil nas logisticky urad a provozuje aktivitu techto korporaci na uzemi Bir Tawil, tovarny, vyroba aut, vyroba levitujicich aut a lodi, vyroba letadel, vyroba zbrani a vojenske techniky, vyroba stavebni techniky a mrakodrapu, mnoho dalsich forem tovaren ktere jsou svoji obchodni aktivitou zavisle hlavne na nasi direkci a urceni strategie trhu. Tovarny ktere se tak stavaji ziskem pro Vasi banku prostrednictvim management investic a rozvojovych strategii, prostrednictvim moznosti se spolecne sjednotit a vytvaret strategie pro rozvoj a globalni obchod, tak I pro zalozeni noveho uzemi ve vesmiru, uzemi ktere bude plne obchodni svobody. Vase spoluprace a pro Vas znamena vyznamne vyhody, napriklad tvrda konkurence proti opozici ktera neni s ucasti na spolecnem politickem aktu Korporatokracie. Vase banka uz nikdy nebude ohrozena Bankrotem a zaniknutim. Vase Banka ma pristup ke vsem thrum na celem svete. Vase Banka proto muze kontaktovat jakoukoliv obchodni osobu a navrhnout obchodni activity. Vase banka ma pristup k neomezenemu zdroji vsech surovin, a tak k vyznamnemu trhu na technologiich a modernich formach zarizeni. Vase Banka taky muze zakladat outsourcing korporace a proto se obchodne rozsirovat a strategicky manipulovat s vlastnimi obchody, v zajmu lepsiho uspechu vaseho trhu, velke vyhody mezi outsourcing korporacemi a proto s vlastni aktivitou jen pro vyuziti zisku. V tomto pripade je soucasna moznost rozsirit strategii rozvoje prvnich korporatnich kolonii a tak ihned ziskat schopnost korporatni spoluprace ktera bude vyznamnym zpusobem posilovat uspech a novy stat ktery tak muze formalne, obchodne a socialne sjednotit cely svet, vyznamne podporit svetovou ekonomiku. Vytvoreny urad proto vytvori zakladni format spravni jednotky, ministerstva a jine uredni centra jako je napriklad centralni Urad Financi a rozvoje, Centralni Urad ekonomiky, Centralni Urad pravnich zalezitosti, centralni urad transport, Centralni Urad pro registr firem a korporaci, Centralni Urad pro Mezinarodni Komunikaci, Centralni Urad pro planovani strategie, Centralni Urad pro Tezbu a vytvareni zdroju surovin, Centralni Urad pro zemedelstvi, nase activity budou brzy skutecne na urovni vyspele politiky a proto je potrebne zajistit funkci taky pro Centralni Urad Bezpecnosti a Armad. Kazdy urad bude financne sponzorovany z vlastnich obchodnich aktivit a zisku ktery bude vyhodne a strategicky investovany do dalsich moznosti rozvoje. Vase investice do funkci uradu, vzdy 100% z hodnoty vasich investic. Dnes, aktivita v podobe Korporatokracie, my zijeme v dobe ktera pro nas prinasi moznost vyuzit tohoto kroku jako prvni nejvetsi historickou moznost pro skutecny format Globalni Spoluprace a vytvoreni mnoho forem novych civilizaci a svetu v rozsahu velkeho vesmiru. Nabidka ktera je krokem k nejvetsim uspechum lidske rasy. Centrum nasi spoluprace podle hodnot ktere my sami vytvorime a naplanujeme, tak jak bude rozmer nasi spoluprace vyhodny a uspesny pro nas, tak jak je vyhodne v zajmu strategie nasich trhu. Moznosti ktere jsou nejvice vyhodne pro kazdou Banku v celem svete. Kazda Banka ktera bude podporovat Korporatokracii, Banka proto spolecne vytvari skupinu legalni identity jaio Rada Centralni Banky a proto se vyznamnou schopnosti ovlivnit hodnoty trhu a ekonomickeho pohybu ktery predstihuje rozmer ekonomiky sveta za obdobi vice nez mnoho desitek roku. Nase moznosti pro spolecne activity jsou prvni zajisteny prostrednictvim specialnich levitujicich transport ktere budou schopny dosahnout moznosti pro plny rozvoj v uzemi Bir Tawil, proto my jsme plne schopni okamzite vybudovat zakladni strukturu civilizace ktera bude schopna produkovat dalsi specialni technologie v podobe letajicich mest a orbitalnich mest, dalsi centra naseho obchodu, rozvojovych aktivit a ihned taky jako Globalni centrum pro Konference Korporatokracie a vsech obchodniku v celem svete, idealni pozice pro otevreni vlastni Bankovni pobocky a rozsireni obchodu. Bir Tawil je uzemi ktere prostrednictvim rozvojovych projektu Imperium of diamond’s dokaze dosahnout na populacni uroven 10.000.000 osob do obdobi jednoho roku od prvniho dne funkce Uradu. Letajici mesta, a Orbitalni mesta mohou dosahnout na uroven ktera skutecne muze byt se vyznamnou schopnosti dosahnout populacniho rozmeru a capacity v podobe nekolik stovek milionu osob. Prvni zajem je krok pro vytvoreni Orbitalniho mesta pro 70.000.000 osob. Vlastni zdroje surovin, vsechny vyrobni cykly jen z vlastniho trhu a prostrednictvim vlastnich ekonomickych cyklu, zadne rizikove obchody a vzdy jistota stability, uspechu a dosahnuti cile. Letajici a Orbitalni mesta mohou vyuzivat vlastni infrastrukturu obchodu a prumyslu, mnoho forem dostupneho uzemi se zdroji surovin z rozsahu celeho sveta, vyznamne schopnosti ktere jsou skutecne schopne dokazat vyznamnych ekonomickych uspechu ktere jsou jiste potesujici kazdeho obchodnika, tak taky Banku. Nase zdroje surovin, v zajmu zacatku prvnich kolonii na uzemi Bir Tawil, a tak brzy kolonie na uzemi Orbitalnich Mest, nebo na dalsich planetach, my spolecne dokazeme vytvorit kolonie ktere budou schopny vyuzivat prvnich Bir Tawil zdroju surovin na uzemi Mezinarodnich Vod, doly pro tezbu zelezne rudy, kovy, bor, mnoho forem dalsich jinych vyznamnych surovin pro nase activity a zajisteni schopnosti se rozvijet na urovni dalsich planet. My spolecne dokazeme otevrit mnoho surovinovych dolu v blizkem oceanu, a tak vyuzit suroviny pro rozvoj kolonialnich tovaren ktere pro nas umozni vyuzivat specialni technologie se schopnosti cest na uzemi dalsich planet. Dalsi planet pro nas budou silna podpora ktera znamena neomezeny rozsah surovin pro tezbu a vyznmane zdroje, kovy v mnoho formach materialove podoby, tak znovu moznost pro neomezene rozsireni specialnich zon prumysloveho provozu a vystavba dalsich specialnich lodi pro cestovani, nebo civilizacni infrastruktury. Nas cil a schopnost je vytvorit nasi vlastni telekomunikaci, nasi vlastni radiovou linku a internet, nase vlastni systemy civilizacniho charakteru ktery bude ihned zalozeny na schopnostech vyuzivat activity v civilizaci Bir Tawil, mrakodrapove mesto o rozloze 2060 kilometru ctverecnych, mrakodrapy z sto pater jako minimalni zaklad, pres dvacet pater pro pesi zonu, pres deset pater vzdusnych digitalnich dalnich a levitujici transport osobniho typu auta ktere budou vyuzivane pro lety mezi planetami do dalsich kolonii na Marsu, na Mesici, na jinych planetach. Vytvorime dohody mezi Egyptem a Suadenm, ziskame spolecne schopnosti se rozvijet, vodni trasy, rozvojove projekty, dosah mnoho forem surovin, pracovni silu, nase schopnost je produkovat Roboticke paze Imperium of Diamond’s ktere mohou zajistit vznik jeden million produktu behem jedne vteriny. To je skutecne hodnota ktera predstihuje maximalni logiku svetoveho rekordu. Nase civilizace proto dokaze byt postavena behem nekolik pouhych dni. Hodnota noveho New Yorku, Shanghai, Dubai, Pariz, Londyn, Toronto, vyspele velkomesto. Velkomesto ktere se politicky a obchodne rozsiruje do vesmiru, na uzemi dalsich sto planet jako Hvezdne mesto s nezavislimi zdroji surovin, planetarni prumyslove zony a schopnost vybudovat skutecne civilizacni kosmicke lode behem nekolika kratkych tydnu. Jedna kosmicka Civilizacni lod v rozmeru Parize muze byt vytvorena do obdobi jen pouhy jeden tyden, sedm dni. Civilizacni lode pro minimum populacni capacity pro 10.000.000 osob. Vytvorime taky Globalni Digitalni Orbitalni linie ktere budou spojeny s mesty Bir Tawil, Orbitalni Mesta, Letajici mesta a dalsi jina mesta na okolnich planetach ve vesmiru. Digitalni Linie mohou navigovat transport soukromych levitujicich automobile, a tam zajistit schopnost brzy kontaktovat ostatni centra v celem svete a ve vesmiru, proto nase infrastruktura organizacni logistiky a obchodu bude vyznamnejsi nez na rozsahu dnesni svetove ekonomiky. My spolecne skutecne vytvarime novy svet a rozmer lidske rasy. Jako Korporatokracie, my Vytvorime pravidla ktera jsou vyhodna pro nejlepsi uspech obchod, bezpecnost obchodu a jistota v dobry uspech. Nase pravidla a zasady nasledne budeme transformovat na uroven nasich sil ktere znamenaji schopnost rozhodovat o aktivitach svetove politiky v zajmu obchodu a obchodnich pravidel. My spolecne vytvorime subject ktery bude rozhodovat o svetove aktivite a system trhu, my spolecne dokazeme rozsirovat vyznamne strategie pro rozvoj nasich bank a zasady nasi activity. Centrum vsech obchodniku z celeho lidskeho sveta, nejvice vyznamna civilizace na uzemi lidskeho sveta. Tak my budeme vytvaret vlastni format mezinarodniho styku s ostatnimi organizacemi, vlastni format naseho styku s ostatnimi subjekty, nas vlastni format zasad a strategii, my budeme vytvaret proctor v pomeru hodnot skutecne noveho sveta ktery je plny mnoho vyznamnych moznosti. Kazda Banka v celem svete, tak I Obchodnik. Tak proto chci poprosit Vase strany, o moznost nasi spolecne activity a moznosti pro logistiku, je dobre vyuzit techto nabidek, je dobre vyuzit techto kroku a moznosti, protoze ja pro vas nabizim silne uspechy a vitezstvi ktere je urcene pro cely svet, pro dalsi banky a korporace ve vasem okoly, taky pro dalsi jine skupiny obchodu v celem svete. Pro moznost okamziteho uspechu nasi globalni mobilni spoluprace, je dobre podporit kontaktovani Global Economic Forum, jina for a v celem svete ktera se zakladaji pro medialni zpravodajstvi a komunikaci v zajmu obchodu a svetove ekonomiky.